DRIVING DIRECTIONS to Fannie Breeze’s Homesite from I-85 North, Exit 170: at the bottom of the ramp, merge onto Hwy. 70. Immediately move into the left lane and make a U-turn using the median cut-through. You are now heading west on Hwy. 70. Move into the right lane. Turn right at the first light onto Pleasant Green Road. You will pass the Pleasant Green Access and cross over the river. In 2 miles, turn left onto Cole Mill Road. You will reach the Few’s Ford Access of Eno River State Park in less than 1 mile. The physical address is 6101 Cole Mill Road, Durham NC 27705. Continue on the park drive until you reach the park circle at the end. Park here at the Cox Mt. Trailhead. DRIVING DIRECTIONS to Fannie Breeze’s Homesite from I-85 South, Exit 170: at the bottom of the ramp, merge onto Hwy. 70 West. Stay in the right lane and turn right at the first light onto Pleasant Green Road. You will pass the Pleasant Green Access and cross over the river. In 2 miles, turn left onto Cole Mill Road. You will reach the Few’s Ford Access of Eno River State Park in less than 1 mile. The physical address is 6101 Cole Mill Road, Durham NC 27705. Continue on the park drive until you reach the park circle at the end. Park here at the Cox Mt. Trailhead. DRIVING DIRECTIONS to Fannie Breeze’s Homesite from I-85, Exit 173: head north on Cole Mill Rd. away from Hillsborough Rd. Stay straight on Cole Mill Rd. for approximately 4 miles. You will cross the river and come to a stop sign at the Pleasant Green Rd. intersection. Continue straight and in less than 1 mile you will reach the Few’s Ford Access of Eno River State Park. The physical address is 6101 Cole Mill Road, Durham NC 27705. Stay on the park drive until you reach the park circle at the end. Park here at the Cox Mt. Trailhead. HIKING DIRECTIONS to Fannie Breeze’s Homesite: take the Cox Mountain Trail (blazed with blue dots) from the loop parking lot. In less than ½ mile you will reach the river and the suspension bridge. This is the only hiking bridge across the Eno within the state park. After crossing the river, continue straight on the Cox Mt. Trail. There will be several options for turning left off the trail. Stay straight until you reach the Fanny’s Ford Trail (blazed with purple dots). Turn left onto the combined Cox Mt./Fanny’s Ford Trail. In a few hundred feet you will come to an intersection where the trails split. Go straight, taking the middle trail (the left trail is Cox Mt., the right trail takes you to the Fanny’s Ford Campground. The middle trail is the Fanny’s Ford Trail (purple dots). The trail gradually heads downhill to the river. Once you reach the river look for a bench on the left side of the trail. From the bench, look down and to your left; you should see a downed tree covering an old roadbed. This spot is Fannie’s Ford, the low, rocky place where Mrs. Breeze would cross the Eno. Carefully, get down onto the old roadbed just uphill of the downed tree. Turn and hike up the road away from the river. It looks more like a dry stream at first, but as you continue uphill the road flattens and is more apparent. Shortly, the road becomes hard to traverse because it is thick with downed trees and vines. At this spot, the right bank of the road is shored up with rocks. Turn to your right and climb out of the roadbed. Follow the ridgeline uphill, away from the road. As you reach the top of the ridge, the river comes back into view on your right. Uphill, you should see some rock piles as well as a long line of loosely stacked rocks. Just above these rocks is the homesite. There you should see a huge cedar tree with a split trunk near its base. After exploring, head back down the ridgeline to the old road and back down the road to the bench at the Fanny’s Ford Trail (purple dots). Follow the Fanny’s Ford Trail downriver. You will pass the campground on your right, Few Falls will also come into view on your left, and then you will reach Few’s Ford. Head uphill to the intersection with the Cox Mt. Trail (blue dots). Stay straight, taking the Cox Mt. Trail back to the suspension bridge and the loop parking lot. The round-trip hike is approximately 3 miles. Fannie Breeze is remembered and talked about to this day, unlike many other slaves who lived and worked in the Eno River Valley. Why, you ask? Because, she was an important person in the community, a midwife who helped black and white women, alike, give birth to many children whose families still live in the area today. Three pieces of evidence we have concerning her status and continued importance: she attended what was, at the time, an all-white congregation; she is buried in a historically white cemetery; and a likeness of her is painted on one of the courtroom walls in the old Orange County Courthouse in Hillsborough. Though written records of Fannie Breeze’s existence are few, her story has been passed down by word of mouth for several generations. One such record comes from an interview of Mary Scarlett Jones conducted by Joe Liles in 2003. You can read it online at: http://enoriver.org/fishdam/auntmary9.htm. Mrs. Jones describes what “Aunt Fannie Breeze” and other midwives would do for the families of their community. We hope you enjoy discovering Fannie’s homesite and consider adding a visit to her and her family’s gravesites to your list of hidden gems. They are buried in the cemetery at the Pleasant Green United Methodist Church, 3005 Pleasant Green Road, Durham NC 27705. 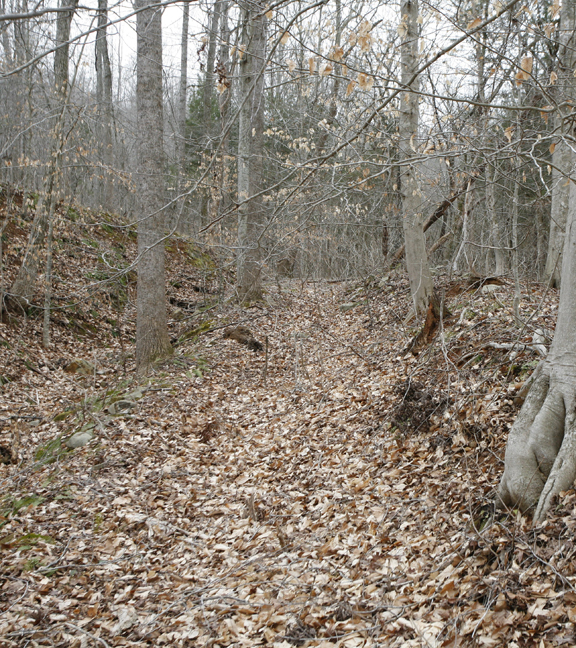 The left photo below (by Joe Liles) shows the remains of Fannie Breeze’s homesite. 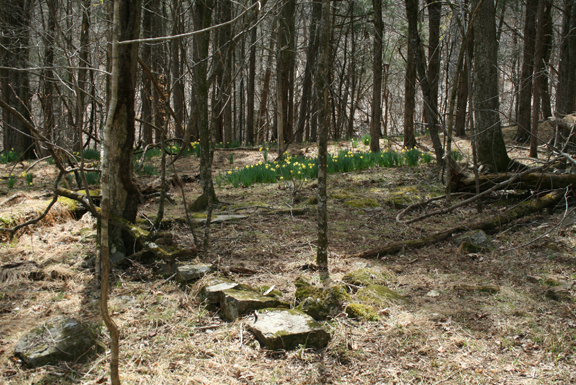 All that is left includes part of a stone foundation outlining the dimensions of the cabin, a couple piles of rocks where chimneys once stood and a large cedar tree. Walk around and explore, but please do not disturb the site or take anything with you. The right photo below (by Joe Liles) is of the old road that heads up the hill from Fannie’s Ford, a shallow, rocky place of crossing. At this spot, Fannie would ford the Eno by foot, horseback or wagon when visiting folks who lived on the other side of the river. As you hike up the road, take note of its characteristics and the measures used to shore up its sides. Learning what to look for will help you to discover the many other roads and fords criss-crossing the Eno River Valley.